The objective of this Lab activity is to verify Thévenin’s theorem by obtaining the Thévenin equivalent voltage (VTH) and Thévenin equivalent resistance (RTH) for the given circuit. Verify the Maximum Power Transfer Theorem. In this tutorials we use the terminology taken from the user manual when referring to the connections to the Red Pitaya STEMlab board hardware. Extension connector pin used as 3.3 V voltage source are show in the documentation here. Thévenin’s Theorem is a process by which a complex circuit is reduced to an equivalent circuit consisting of a single voltage source (VTH) in series with a single resistance (RTH) and a load resistance (RL). After creating the Thévenin Equivalent Circuit, the load voltage VLor the load current Il may be easily determined. One of the principal uses of Thévenin’s theorem is to replace a large portion of a circuit, often a more complicated and uninteresting part, by a simple equivalent. The new simpler circuit enables rapid calculations of the voltage, current, and power which the more complicated original circuit is able to deliver to a load. It also helps to choose the optimal value of the load (resistance) for maximum power transfer. The Maximum Power Transfer Theorem states that an independent voltage source in series with a resistance Rsor an independent current source in parallel with a resistance Rs, delivers a maximum power to the load resistance RLwhen RL= Rs. In terms of a Thévenin Equivalent Circuit, maximum power is delivered to the load resistance RLwhen RLis equal to the Thévenin equivalent resistance RTHof the circuit. Instead of voltage source “Vs” shown on the Figure 1 use the STEMlab voltage pin on extension connector E1. Use the Oscilloscope application by connecting channel IN1 to the + node of VLand connect channel IN2 to the - node. VLwill be the difference between IN1 volts and IN2 volts. This value will later be compared to the one you will find using Thevenin Equivalent. To get voltage values of IN1 and IN2 select MEAS menu, select MEAN value and select DONE. 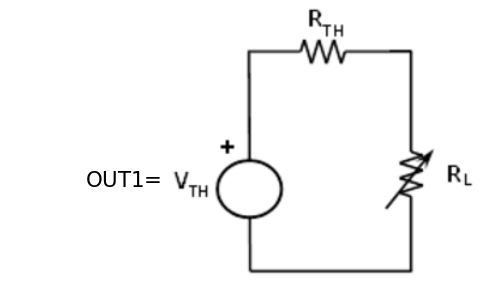 Find RTH: Remove the source voltage Vs and construct the circuit as shown in figure 5. 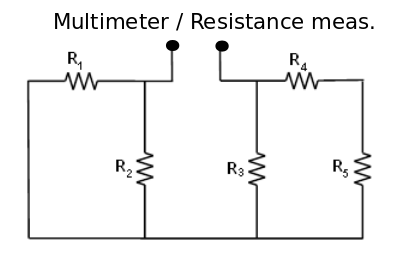 Use the Multimeter to measure the resistance looking into the opening where RLwas. This gives RTH. Make sure there is no power applied to the circuit before measuring with the Multimeter and the ground connection has been moved as shown. Fig. 5.5 Figure 5: Measuring the Thevenin Resistance RTH. Obtaining VTHand RTH, construct the circuit of figure 2. Create the value of Rrhusing a series and or parallel combination of resistors from your parts kit. Using the Oscilloscope & Signal generator application - connect channel OUT1 for the VTHsource. In the OUT1 settings menu select “DC” signal waveform and in the Amplitude field set the value to what you measured for VTHin step c). Select “enable” button. With RL set to the 1.5 KΩ used in step b) measure the VL for the equivalent circuit and compare it to the VL obtained in step b). This verifies the Thévenin theorem. Then, interpolate between your measurements to calculate the load resistor value corresponding to the maximum power (Pl max). This value should be equal to RTH of circuit in figure 7 with respect to load terminals. Calculate the percentage error difference between the load voltages obtained for circuits of figure 1 and figure 2. Using Voltage Division for circuit of figure 2, calculate VL. Compare it to the measured values. Explain any differences. Calculate the maximum power transmitted to the load Rl obtained for the circuit of figure 3.